Obituary for Joseph Patrick Periard | Langeland Family Funeral Homes, Inc. Passed away on Monday July 2, 2018 following a lengthy illness. Age 54. Joseph was born in Bay City, MI on June 2, 1964, the son of John Edward Periard and Martina Ann Wiedyk. He graduated from Bay City Western High School. He attended Michigan Tech University where he received his Bachelors degree in computer science. He was employed with Ford Credit in Detroit. He was a member of First Congregational Church in Kalamazoo. 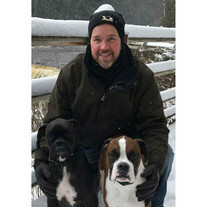 He enjoyed camping, spending time in the Upper Peninsula and loved his dogs. Joseph is survived by his loving husband, Joseph (Biron) Periard, who he was united in marriage with on March 31, 2017. Also surviving are his daughter, Emery Biron; mother, Martina Periard; brothers and sisters, Lee (Sharon) Periard, Tim Periard, Cindy Lighter and Jean (Jim) Jasman; two nephews, Kyle Jasman and Chad (Alexandra) Jasman. He was preceded in death by his father, John Periard; and his brother-in-law, Morgan Lighter. Cremation has taken place and a private family service will be held. A public celebration of Joseph's life will be held at a later date. In lieu of flowers memorial contributions may be given to SPCA of Southwest Michigan. Arrangements by Langeland Family Funeral Homes, Memorial Chapel. Please visit Joseph personalized webpage at www.langelands.com to sign the online guestbook or leave messages for the family.